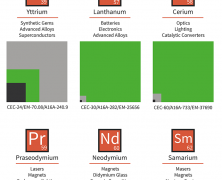 Home » Posts Tagged "Metal"
From Tungsten to Strontium, here’s a list of five minerals that shaped tech industry and modern life and are largely defining our lifestyle. Did you know that steel is the most recycled material in the world? And further, recycling and reusing steel is remarkably cost effective, compared to other materials, due to its unique unwearable properties. Learn how the job is done and see some interesting statistics about steel. 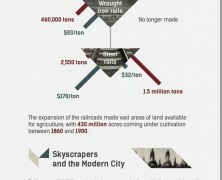 From ancient knives to modern skyscrapers, steel is present in almost everything we use today. Learn more about the most revolutionary construction material and its contribution to human living through the ages with this graphic. Following to the history of copper, comes this market analysis that highlights production, supply, demand and consumption worldwide. 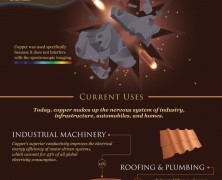 Copper has a very long and rich story in the human history. Discover its uses over time, its features and the reasons that make it one of the most essential metals in our world. A nice journey to the silver quest trough time, its uses and its value perception. 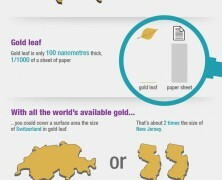 Though second to Gold it’s extremely valuable both as store of wealth and as element in modern industy and technology. Here is the 3rd part of the gold series, that outlines its 3 major uses in modern times. You will also learn how world demand is allocated across countries and how it’s connected to strong economic growth. 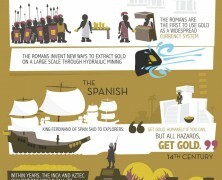 It’s part 2 of the gold infographic sequel and here you can learn about the mining technologies as well as the 3 streams that make up the gold supply. 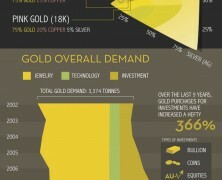 An interesting sequel infographic that examines the gold eco-system. Here you see No 1 referring to the history and properties of gold starting from 3600BC to 21st century. 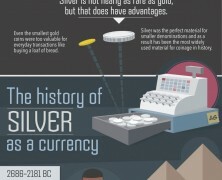 Fascinating insights about the world’s most famous precious metal.